Books can transport us anywhere! 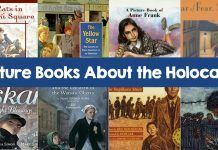 Read around the world with these 30 books for elementary books set in Chile, France, Japan, China, and more! Reading can bring you so many places! From ancient Egypt to modern day in a different country, literature can help us better understand the world around us. 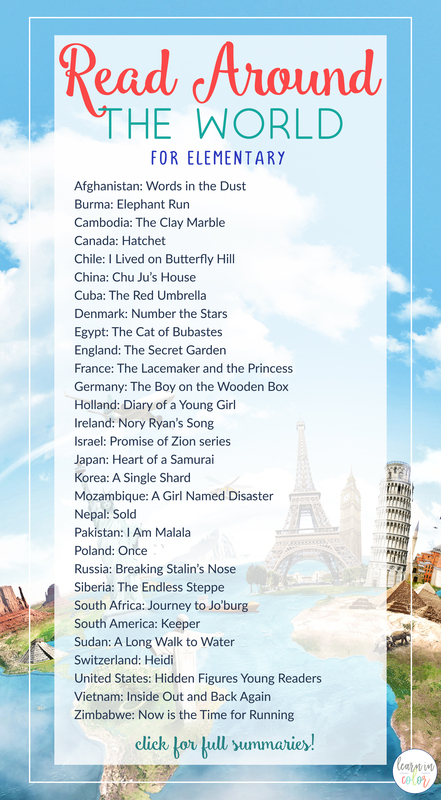 Enjoy these books set in 30 other countries across North America, Africa, Europe, and Asia. Zulaikha dreams of all that is possible now that the Taliban has been driven out of Afghanistan. Although, many obstacles such as her cleft palate, difficult relationship with her step mother and time spent away from school could stand in her way. 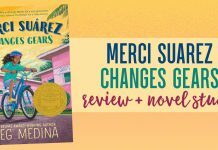 She finds a new friendship that promises the possibility of changing all of these what ifs, but what price does this come with? In 1941, bombing in London causes Nick’s mother to fear for her son’s future and sends him to Burma to live with his father. Although, upon his arrival trouble starts in Burma as well and Nick’s father is taken prisoner. He finds friends as he sets off to save his father on elephant back. The worn torn country of Cambodia becomes too much for Dara, her mother, and older brother. They find sanctuary in a refugee camp near Thailand. Although things are finally looking up for their family, Dara becomes separated from them when a fight breaks out. The first of five books within this series, Hatchet tells the story of Brian Robeson, a thirteen year old who ends up in a forest all alone after a deadly plane crash. With only his hatchet accompanying him, Brian must fight to survive. Telling the story of Brian’s physical challenges and the struggles within his own mind, this book is sure to touch all who read it. When the political unrest in Chile becomes too much to ignore, Celeste Marconi’s eyes are opened to the danger that surrounds these events. Her parents eventually decide it’s too dangerous for Celeste to continue living at home and send her off to America. Follow Celeste as she struggles to realize what’s happening in her home country and how to survive in a new country. Chu Ju’s perspective of her world is changed when a girl is born into her family, but the country’s birth laws require her to be sent away. In order to save her new sister from this law, Chu Ju sets out in the middle of the night to run away. This inspiring story introduces us to a girl willing to sacrifice her own comfort to combat injustice. Lucia, a fourteen year old girl from Cuba makes the trip to America as a part of the Operation Pedro Pan. Finding herself in a new country, without the company of her family presents Lucia with many challenges. 12 year old Annemarie is growing up in Denmark during WWII. In this beautiful story of courage, she helps her Jewish friend Ellen escape safely to Sweden. As a country, Denmark was able to save around 99% of their Jewish population during the Holocaust. 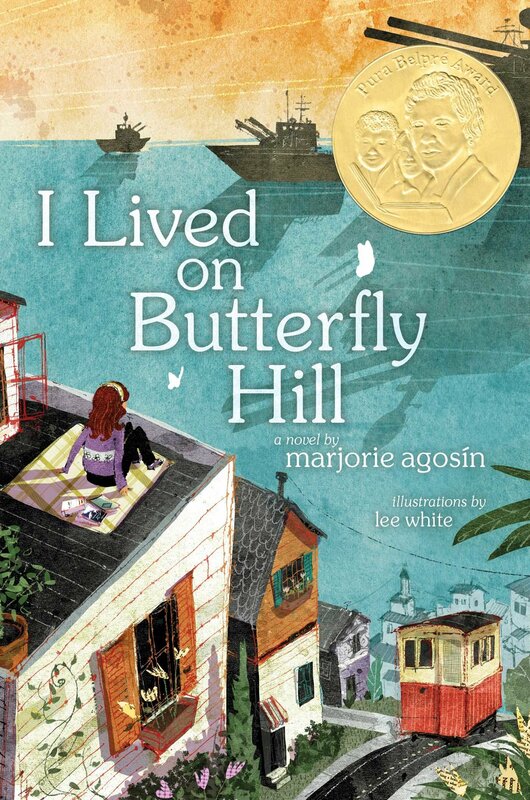 This Newbery winning story is a classic tribute to their bravery. When the Rebu nation is invaded by Egyptians, their king is killed and their prince is taken as a captive. Amuba, the prince and his charioteer are taken back to Egypt to work as servants and while working, discover the conspiracies of the Egyptians. Although, in an attempt to flee the city, they accidentally kill the successor to the Cat of Bubastes, one of the most sacred animals in Egypt. What does this mean for their future? When Mary is sent to live at her uncle’s home after becoming an orphan, she finds the mansion he lives in to be just as odd and mysterious as her uncle. One day, she finds a door that leads to a secret garden, but is unable to enter it. She sets off to find a way in, with her mind set on bringing the garden back to life. This story was inspired by an actual relationship that blossomed between Marie Antoinette and a commoner. 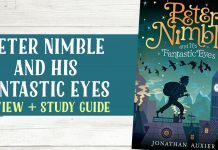 It tells of a young lacemaker who gets the chance of a lifetime, working as a hand to the princess despite her grandmother’s disapproval. Although, when the town talks of a revolution, Isabelle’s new life is at stake. Oskar Schindler was known as a Nazi who rescued over 1,100 Jews from certain death. 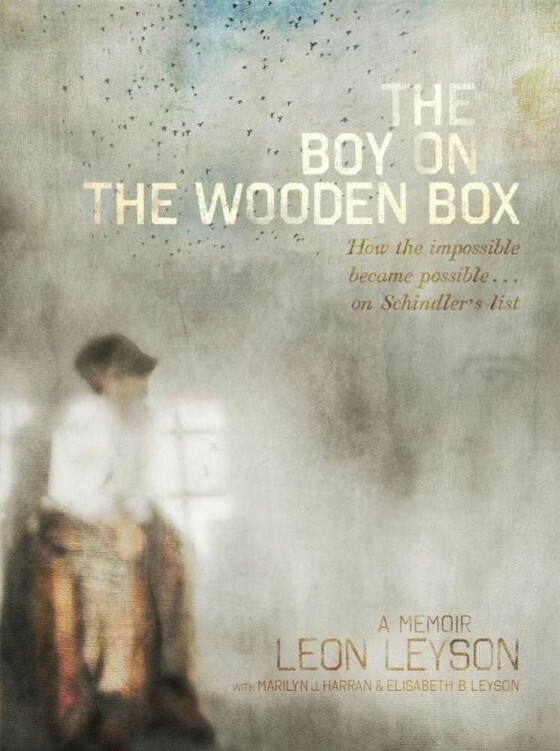 This is the memoir of one of the youngest of “Schindler’s Jews” to survive, Leon Leyson who was 13 years old. Read the story of Anne Frank, a young girl whose family goes into hiding during the period of Nazi control in Germany. While in hiding and even after being taken away as a concentration camp prisoner, Anne documents many of her struggles in her diary which she calls kitty. Her father later published this diary entries along with her family’s story. Nory is living in Maidin Bay when the terrible blight of the potatoes occurs. She must fight for not only food, but also hope for her family. It also has a lovely sequel, Maggie’s Door, where Nory and her family travel to America. I’ve read the first book in this series, Promise Breaker, and loved this thrilling series set in 1947, after the Holocaust and right before Israel became an official country. Thirteen year-old Dov sets off for the Promised Land on his own. Along the way, he meets Emily, the spoiled daughter of a British major. From Arab-Israeli tensions to the British rule over Palestine before it became Israel, this is an excellent introduction to Israel and post-WWII. In 1841, a Japanese fishing ship sinks and the crew is forced to find shelter on an unknown island. They are eventually rescued by an American ship but living life in America may not be the dream that everyone talks about for fourteen year old Manjiro. As he gets older, he wonders about the culture he left behind and dreams of being a Samurai, but some serious obstacles stand in his way. 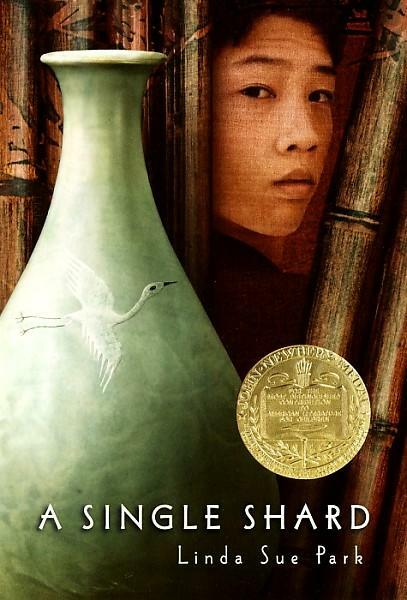 Tree-ear, a young Korean orphan living under a bridge, becomes fascinated with a local potter, Min’s art. He dreams of creating his own pottery, but when Min takes him in as his apprentice, Tree-ear realizes the hard labor and pain that goes into the art and working with Min. Follow this story as Tree-ear fights to prove himself. Nhamo, an eleven year old girl, lives in a small village of Mozambique. It’s time for her to grow up and her family pushes her to marry a man she finds cruel. In order to avoid this pairing, Nhamo runs off to Zimbabwe. This journey goes from a short trip to a year long fight for survival. Although fictional, this book is definitely hard to read at times. It brings light to the problem of human trafficking in today’s modern culture from the point of view of a young girl. It’s written poetically and is a brief read tackling a difficult subject matter. Malala Yousafzai’s home region was under control of the Taliban for most of her life. Although their strict rules kept women from a lot, Malala stood up so that no one could stand in her way to be educated. On October 9th, 2012, Malala’s courage to stand up for what she felt was right resulted in her being shot point blank. 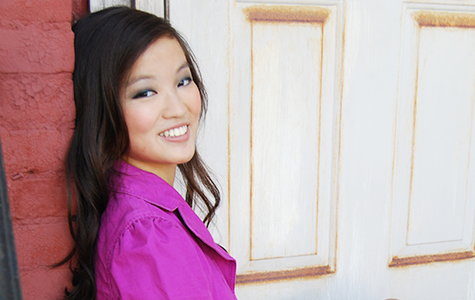 No one thought she’d survive, but she did and now her story is one that has inspired millions. 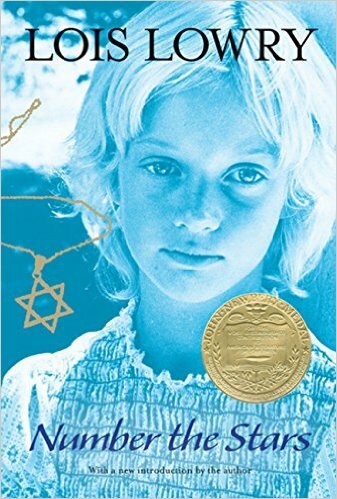 “To Felix, everything is a story.” This book follows Felix, a young Jewish boy hiding from the Nazis in a Catholic orphanage. He doesn’t understand that he’s in hiding, but instead thinks that he is just in someone else’s care while his parents are traveling. One day he believes they’re in trouble and sets off to find them, crossing right into Nazi territory. Sasha has dreamed of joining the Young Pioneers for years now. Although, when the day finally comes, everything goes haywire. This mess turns into Sasha breaking a bust of Stalin, the country’s leader at the time. To make everything worse, Sasha’s father, a devoted communist is arrested. Follow Sasha as his entire world seems to crash. The Rudomin are arrested by the Russians and accused of being capitalists. They are forced out of their home in Poland and taken to Siberia. 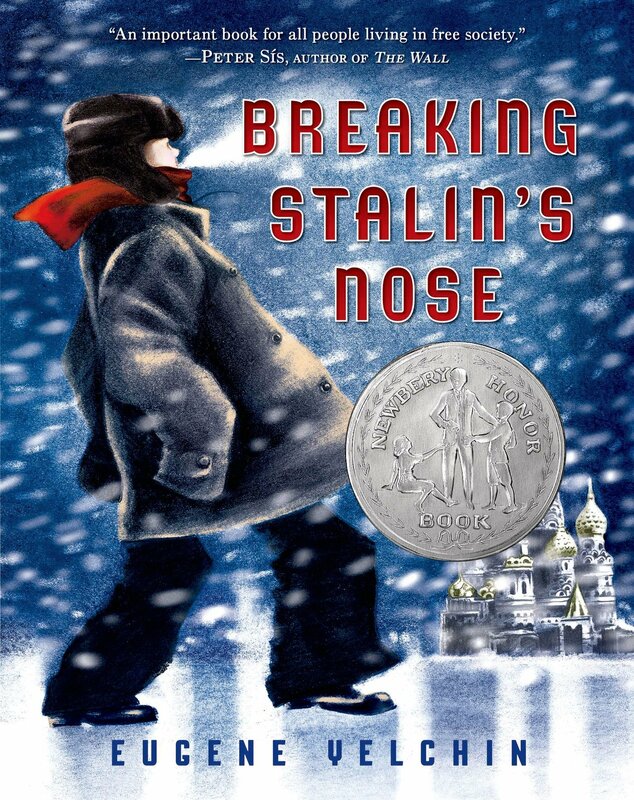 Not only does this book tell the story of their journey, but also of their hard life spent as prisoners in Siberia. 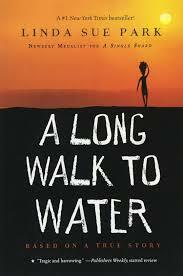 Mma lives 13 miles from her children and when her youngest gets sick, Naledi and Tiro set out on a journey to find Mma. The struggle for freedom and dignity are clearly present within this book and the inspiring story of this family will touch you. El Gato, the legendary goal keeper for South America who took his team to the World Cup gets the chance to share his story. He talks of living in the rain forest as a young boy and meeting a keeper who becomes his mentor who brings him to the success he now finds. 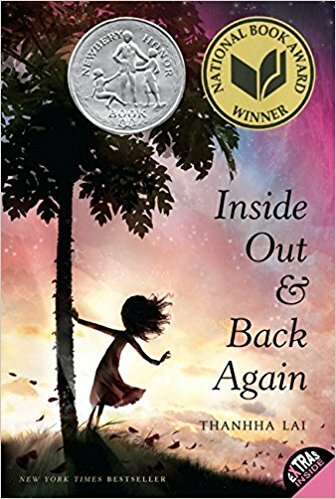 This books tells the inspiring stories of two separate characters, Nya, a girl living in Sudan in 2008 and Salva, a boy who became one of the “lost boys of Sudan” in 1985. Follow their journeys as they contrast greatly but also eerily relate. Heidi, a young orphan is sent to live in the Alps with her grandfather at the age of five. She loves her life in the mountains, finding beauty in her company and the nature that surrounds her. Although, her aunt soon comes and takes Heidi away, moving her to a live with a new family in town. Follow Heidi as she fights to find her way back up to the Alps. Follow the three women who changed the history of Nasa by overcoming prejudice and proving themselves to the world of discrimination and doubt around them. Not only was our space program changed, but our country’s perspective on segregation was altered during these events as well. After the fall of Saigon, Ha and her family must flee. Their new lives are waiting for them in America. Follow Ha and her family as they head toward hope together. Deo, his older brother Innocent and their friends play soccer in the streets of their home country, Zimbabwe. They enjoy the fun of the game together until the soldiers come and their lives are changed forever. The boys must flee their home and seek out a safe haven in South Africa. Refugee by Alan Gratz tells the story of three refugee children across three different time periods. We meet Josef and his family who are fleeing Nazi Germany, Isabel and her family are escaping Cuba in the 1990s, and Mahmoud is seeking safety from the Syrian War in 2015.